The two days State Conclave on ‘Perspective Planning for Resurgent Agriculture & allied sectors in Arunachal Pradesh’ ended in a logistic note this evening. 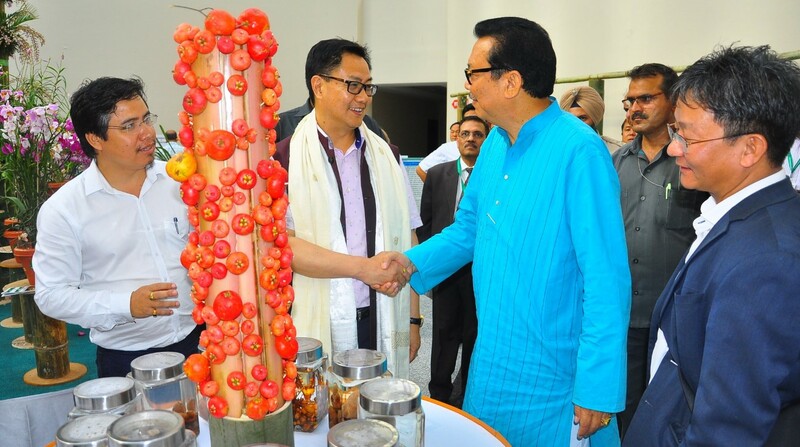 Attending the Valedictory Function as the Chief Guest, Union Minister of State for Home Affairs, Kiren Rijiju said that Agriculture is the only based for sustainable development of the State. He lauded the State Govt for conducting the conclave exclusively on Agriculture and allied sector saying it was conducted in a right time. He urged to integrate the outcome of the conclave in govt policy and to see that the farmers are benefited from it. He further stated that Govt intervention is require for scientific cropping and to establish market linkages for the produce of the farmer citing that most of the farmer’s produce which have increased after adopting scientific cultivation are bound to sell out either in very low prices or let their produce go wastage due to absent of market linkages. He said that it is the point where the Govt intervention is essential. He also urged the Banker’s to reach out to all the stakeholders and sought for coordination between the farmers and the experts to improve the Banker’s credit flow. He cited that it is time to move to the districts and villages to improve their economy. He said, “Arunachal Pradesh is a sleeping giant with vast natural resources and to transform it into economy we need to work harder and adopt proper policies”. He said, “with our potentials, we should have been the supplier of agricultural crops and foods to the rest of the country instead of being a consumer State”. While observing that agriculture growth of the State is more than the national average, he opined that our growth should actually be more than the present rate. Deputy Chief Minister, Chowna Mein in his speech said that the recommendation of the conclave will be incorporated in the next budget and assured that the State Govt will adopt an agriculture based budget in the next year which will aim to improve farm economy. He said that a meeting will be convened by the Chief Secretary with the officers of agriculture, horticulture, veterinary and fishery departments to discuss and work out a road map for framing a viable policy for inclusive growth. In order to transform the policy of the Govt, he urged the officers of the agriculture and horticulture departments to play a pro-active role citing their role crucial for realizing the objectives. He urged the departments to frame guidelines for the immediate implementation of the budget announcements. He categorically said that ‘one size fit all’ formula will not work for the State as the state have diverse climate and land pattern and asked the Agriculture & Horticulture departments to work out specific package of alternate crops for specific districts. He also opined to revamp the Krish Vigyan Kendra’s and utilize their services in research, training and extension works. He further stated that the Chief Minister Pema Khandu led Govt is committed for transformation, innovations and transparency and also devoted to improve the rural/farm economy. On the occasion, Chief Secretary Satya Gopal, Ex-vice Chancellor, Vetrinary University, Ludhiana, Dr V K Taneja, Advisor Agriculture NITI AAYOG, Dr J P Mishra, Deputy Managing Director, NABARD, H R Dave, Commissioner Home, Dr G S Meena and Secretary (Agriculture), Y W Ringu also spoke on the occasion. GM, NABARD, Arunachal Pradesh, Dr Gyanendra Mani make a presentation of the Experts recommendation on the occasion. It is pertinent to mention here that Deputy Chief Minister, Chowna Mein, Minister of Agriculture, Wangki Lowang and Minister of AH & Veterinary, Dr Mohesh Chai attended the technical sessions of the conclave. On the two days conclave, brainstorming technical session on four major sub-topics viz., i) Enabling Environment for development of agriculture & allied sector in Arunachal Pradesh, ii) promotion of sustainable use of bamboo, sericulture, agriculture, value chain and agri-export, iii) Promotion o f horticulture, spices and iv) Animal Husbandry & Fisheries Sector were conducted by more than 60 scientists/subject-experts from across the country. More than 800 participants including govt officers, members of NGOs, SHGs and progressive farmers attended the Conclave.